Garmin Edge Mount Viber for the PRO Bikegear Vibe Stem is a lightweight 17 gram holder for Garmin Edge or Wahoo Elemnt Bolt computers. It is based on a the Team Sky prototype which we’ve seen in the Tour de France 2017. The Mount Viber will be compared against the alternative K-Edge mount the PRO Bikegear Vibe Stem – Handlebar combination. A little while ago I reviewed the new Vibe Stem from PRO Bikegear, which has some cool internal channels for Shimano DI2 integration. In that review I’ve shared a picture of a very clean looking K-Edge prototype for Team Sky. Weightweenies forum-user Tillquist did develop the Mount Viber, a Garmin Edge and Wahoo Elemnt Bolt mount just like the Team Sky prototype ! As said the Mount Viber follows the design of the Team Sky prototype, and clamps between the Vibe Stem face-place and stem. The front view of the Vibe Stem face-plate has a sort of X-shape, where the middle part of the Mount Viber, centers in the bottom-middle of the X-legs. I’ve marked this position with a green rectangle in the picture. So the Mount Viber perfectly aligns with the center-line of the Pro Vibe Stem. The Mount Viber clamps between the Vibe Stem face-place and stem. The thickness of the clamping part is roughly 3.5 mm of covers the complete bottom area of the face-plate, so there is a really good pressure distribution. 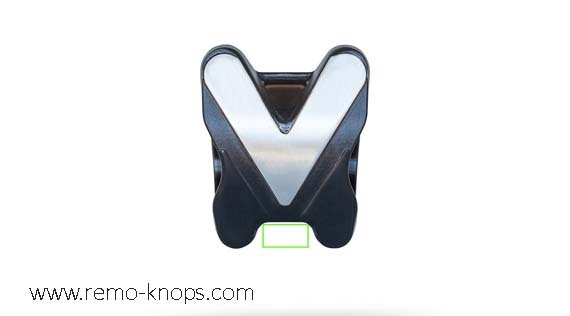 It furthermore results in rock solid clamping, while the elliptical bolt holes (marked with green arrows) make sure you can loose the Mount Viber holder. The thickness of the material just above the holes is less than 1.0 mm, however there is no vertical pressure or force on these areas. In other words, not an issue. The Garmin Edge Mount Viber weighs just 17 grams, including the nylon locking part and hex bolt. This weight is about half the weight of the K-Edge mounts, while the build quality is at least as good. 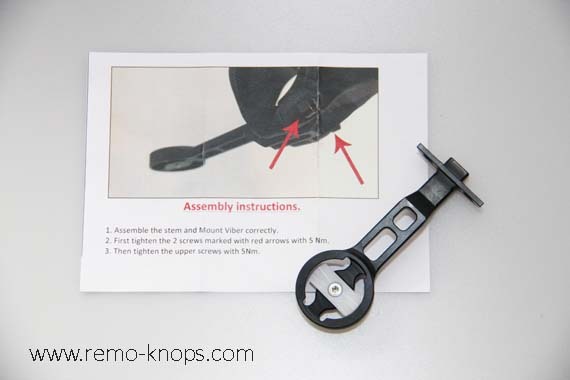 If the nylon locking part would wear out at some point, it can be ordered as a spare part for € 5,–. Garmin Edge Mount Viber comes in three versions, the normal Garmin Edge, the XL Garmin Edge 1030 version and the Wa-Mount Viber version for the Wahoo Elemnt Bolt Bolt bike computers. While Edge Bike Mount offers three different versions, where K-Edge offers a slightly more modular design with computer replacement inserts for Wahoo, Garmin and Sigma. If you can assemble a stem, than you can install the Garmin Edge Mount Viber. All versions, the normal Garmin Edge version, the Garmin Edge 1000/1030 XL-version and the Wa-Mount Viber version for the Wahoo Elemnt Bolt bike computer, have the same price-point of € 55,– The the nylon locking part can be ordered as a € 5,– spare part as well. With just just 17 grams, including the nylon locking part and hex bolt, you get an extremely clean looking cockpit. It now allows me to completely roll the bar-tape up to the stem (and having a symmetrical view on the handlebar). All in all a very cool weight-weenie initiative and I’m happy to support Tillquist with his excellent products. So please check out http://edge-mount.bike/ and get you mounts. Any idea if the brand is planning to have scope to mount GoPro / Light mount underneath? Two small extra holes? Good question. I don’t see any Edge Bike Mount with the option to attach your GoPro of light. 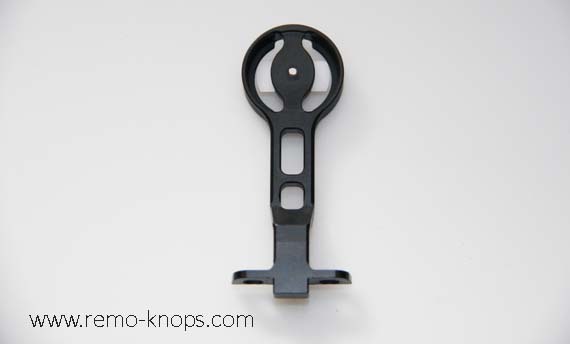 I’ve seen this feature at mounts from K-Edge, however that brand has a different clamping mechanism.